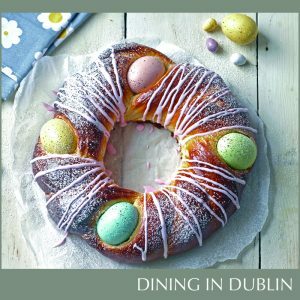 Easter is a time of indulgence and what better way to celebrate than by whipping up Siúcra & Catherine Fulvio’s Pane Pasquale. This melt in your mouth bread is the perfect treat, with a drizzle of melted butter and a cup of tea. A scrumptious goodie for sharing at brunch, with the decorative eggs making it a stunning table centrepiece! Sift the strong flour into a mixing bowl, add the yeast, Siúcra Caster Sugar and salt into the bowl of the mixer. Attach the dough hook. Bring the milk just to the boil, take it off the heat and add the butter, leave to cool until luke warm. Add the eggs and the vanilla extract. While the machine is running slowly, pour enough of the warm milk egg mix to form a soft dough. You may not use all the milk. The dough should come away from the sides of the mixing bowl. Slowly increase the speed and “knead” for about 4 minutes until the dough is smooth. Remove the dough hook, take the dough and place in an oiled bowl. Cover with an oiled plastic wrap and leave in a warm place or rough rising oven for about 1½ to 2 hours or until it doubles in size. Place the dough on a lightly floured surface. Add the orange zest and nutmeg and knead for 1 minute. Divide the dough into 2 equal portions and roll out on a floured surface until about 30cm in length and about 3cm in diameter. Twist the lengths firmly and join each end together. Place onto a parchment lined baking tray. Brush with oil and cover with plastic wrap. Leave to rise for about 30 minutes into a warm place or dough rising oven. When ready to bake place 5 coloured eggs evenly around the loaf. Brush with egg wash. Remove to a cool rack. Combine the Siúcra Icing Sugar with the colour shimmer and dust over the loaf. To make the icing drizzle, place the Siúcra Royal icing sugar into a bowl, add the colour shimmer and a little water and mix well. Spoon into a piping bag, snip of the top and drizzle over the loaf but not over the eggs and leave to set.